This is a concrete block home that is conveniently located about 5 miles north of Dhanis on FM1796. It is situated across from where FM1796 intersects CR421 making it convenient to both Dhanis and Hondo. The home consists of 3 small bedrooms, 2 bathrooms and a large, open living room/kitchen area. There is a nice laundry area with a tile shower. The home is neat and clean. There are two large, covered porches, one in the front and one in the back. They are a great gathering area for family BBQ's, etc.The 2 acres are fenced and are cross fenced to separate the animal corrals from the back yard and large garden areas. There are covered shelters for farm animals, etc. and a chicken coop. In addition, there is good storage available. The back yard has many mature fruit trees.The home is shown BY APPOINTMENT, only. 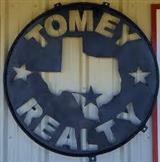 Please call Tomey Realty at 830.426.2480 to arrange to see this great property.